small orchard of trees that birds call home and trees that require limited care just to be…trees. If you really want to grow fruit in your backyard, here’s is my best advice: read. Read a whole lot. Read some more. Visit local nurseries and talk to the owners. By the way, I mean visit real nurseries – not Wal-Mart or Lowe’s. Ask about the fruits you think you want to grow. Ask about the types, the challenges the number you might need to actually get your trees to set fruit. Ask about bugs, pests, blight, pestilence. Find out which fruit trees can survive your winter, your summer, your soil. Ask just how much care they will need – feeding, weeding (some fruit trees don’t play well with weeds at their feet), pruning and wrapping. Ask questions. Listen to the answers. When you’re all done talking, read, everything, one more time, before you make a commitment to growing your own fruit trees or planting a small orchard. Killing trees is a lot more costly than killing seedlings. And removing the bodies requires a shovel, maybe an axe, perhaps a small tractor and always a whole lot of back-breaking digging, chopping and pulling. Killing trees hurts, emotionally, too. I was probably a druid in a former life so when the first two peach trees I planted got Peach Leaf Curl at the tender age of 5, I fought a losing battle for another 2 years to try to save them. When my Apricot went belly up after just 2 short years, I braced her, wrapped her ravaged trunk, sprayed her with dormant oil and watched her long, slow demise over the next 12 months. 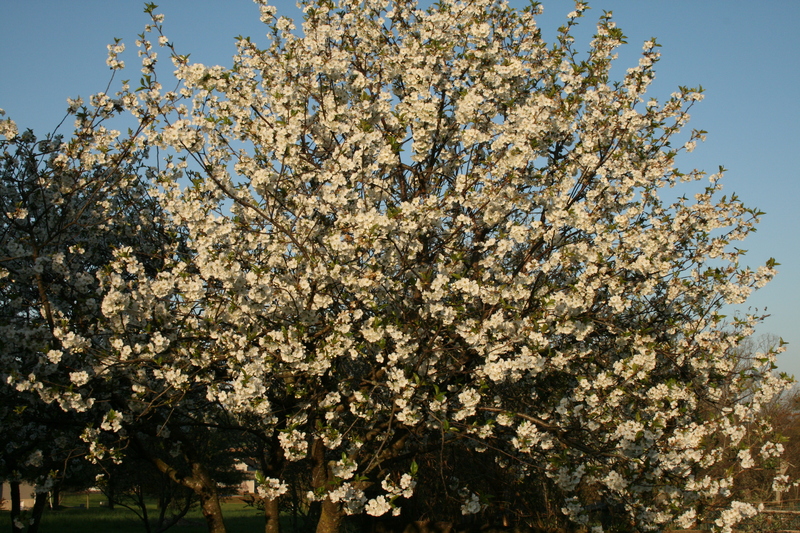 Fifteen years ago, I planted my first fruit trees – 2 Montmorency Cherry trees. Today, I get between 40 and 60 quarts of sour pie cherries off just these two trees. How did I do it? What’s the magic? Darned if I know! They came from the nursery in 5 gallon plastic buckets. I actually left the buckets on when I planted them! And I only dug the hole just big enough and deep enough to shove the bucket into it. No compost, no fertilizer, no loosened soil, in fact, I planted them in the worst possible type of soil – actually it was silt, a fine, orange talcum powder like dirt. And they survived, and thrived and just keep producing bumper crops of berries. Do I recommend this willy-nilly approach to planting fruit trees? No. I just think I was plain old lucky. And I never acted so capriciously again with the lives of trees, shrubs, plants and herbs that were entrusted to me. Pick the site. That’s basic advice but it turns out that fruit trees have some particular requirements. They need fertile soil that drains well. They need space to grow, too, so make sure the site fits the trees you want to put in the ground. Semi-dwarf varieties should be at least 15 feet apart. Standard fruit trees need 20 feet between them. Make sure you know whether the fruit trees you want are self-pollinating or need another tree to set fruit. Plant one sour cherry tree and you’ll get fruit. Plant one apple tree and you’ll get bupkus. If you’re planting bare root stock, make sure you soak the roots of the trees for a couple of hours before you plant them. Root stock or nursery trees should also be pruned of damaged branches and roots. Whether planting bare root stock or container grown fruit trees, you really do have to do some preparation to give the baby trees a good start. Dig a hole that is twice as wide and as deep as the root stock. Add topsoil or peat moss to the hole to enrich the soil and improve drainage. Set the tree in the hole and check the depth. Planting a young tree too deep is almost worse than planting it to shallow. Make sure that the mark on the trunk where the bark was just above ground level because that’s the mark that helps you put the tree into it’s new home at just the right level — just above the top of the hole. Add soil to the hole if necessary then, spreading the roots a bit so they aren’t all clumped into one spot, place the tree in the hole. Put soil around the roots and tamp down but be gentle at first. You can damage or break roots and your tree might get a slow start or might not make it at all, if you do. Fill the hole with soil, tamping it so there are no air bubbles around the roots and bringing the hole back to level ground. If your ground isn’t level or you have high winds from one direction, stake the young tree to keep it upright. Water thoroughly to settle the soil around the tree’s roots. Cover the area with 2 to 3 inches of mulch – pine bark or cypress mulch will help to hole in moisture, hold down the weeds and keep the young trunk from being damaged by the mower. You can also protect young trees from sunscald and animal damage by wrapping the trunk with a paper tree wrap or guard. Water the transplants every week, allowing moisture to drip into the root area and soak it thoroughly. Fertilize your new trees, too, with a nice, balanced fertilizer – 10-10-10 – or just use manure in a ring at the outer limit of the tree’s branches and let it break down into the soil and feed the tree. Once your fruit trees are established, you really need to pay attention to pruning them, every year. Pruning helps to ensure that those dwarf trees you planted don’t shoot up to 25 feet tall…and they will. Pruning also gets rid of suckers – small branches that sap strength from the tree but produce no fruit. And it opens up the trees to more sunlight and makes it easier to see, protect and pick fruit. When fruit sets, about 3 weeks after blooming, make sure you thin it out. Most trees set lots and lots of fruit but leaving it all on the tree will mean smaller fruit. You can take damaged or misshapen fruit off first but if you really want larger fruit, pull off most of the fruit that has set, leaving 5 to 8 inches between each remaining fruit. Invest in a couple of books. Grow Fruit Naturally is my favorite. It’s by Lee Reich and it walks you through picking, planting, growing and harvesting fruit in detail….with pictures. Reich is also the author of the best book on the market that deals with pruning. It’s called The Pruning Book. I have been very successful with cherries, intermittently successful with figs, never got a single apple from 3 trees, waiting for success with my pears (takes them 5 years to decide to flower – who knew) and an unmitigated disaster with peaches and nectarines. If you ask me what made one fruit successful and the other not, I really couldn’t say. But I’ve made my peace with owning an orchard of beautiful fruit trees that produce snowy white or soft pink blossoms in the spring. I love these trees as homes for birds. And I love that they require limited care just to be…trees. This is the final “formal” chapter in my organic gardening book. For the next 4 to 6 weeks, I will be working on formatting for Kindle, getting a covered created and preparing to publish Grow So Easy Organic Gardening on Amazon. I have loved having all of you along for the ride and will be publishing more about gardening and growing and storing in the future but not for a few months. But it’s spring time so you will have plenty to do in your own gardens, back yards, local garden centers and nurseries. So go! Plant!! Enjoy!! !